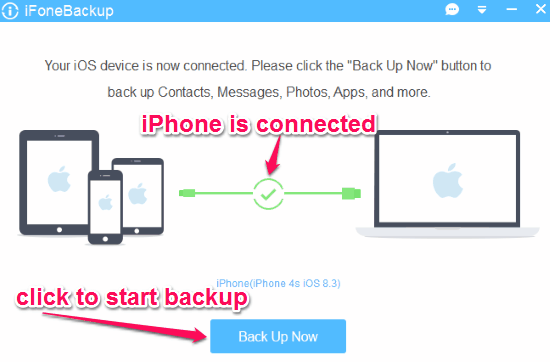 iFoneBackup is a free iPhone data backup software for Windows to backup photos, videos, apps, contacts, notes, etc. It is a perfect alternative of iTunes to backup iPhone’s data. This means that even if you don’t have iTunes installed on your computer, you can easily backup your iPhone’s data. All you need to do is a single click to backup your data after connecting your iPhone to your PC. No more worry about accidental data loss, as you can use this software to backup your entire iPhone’s data on your computer. Unlike, iTunes and other iTunes alternative software, it creates a readable backup file, which means you can access your data directly from the backup directory. You can either use iTunes or other software to restore the backup file created with iFoneBackup on your iPhone. The most interesting feature of this software is that it allows you to encrypt the backup file with a password to secure your iPhone’s data. The following screenshot shows how to backup data using iFoneBackup. You might be thinking that why you should use iFone Backup instead of iTunes. Personally, I don’t like iTunes a lot, because I find it too clunky and takes up too much space as well as resource of my PC. But, iFoneBackup comes with a simple and intuitive interface. All you need to do is launch the software and connect your iPhone to your computer and hit the “Back Up Now” button. Let us see the steps of using iFoneBackup. I have mentioned the link for downloading this software at the end of this post or you can download it from the homepage. 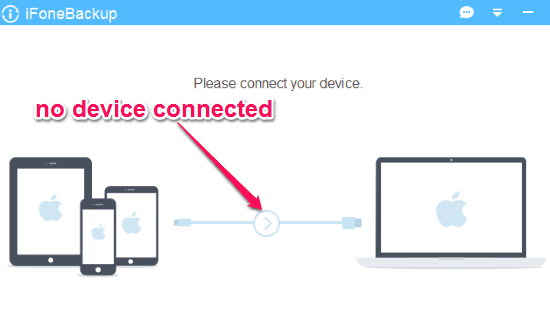 As soon as you install and launch the application, it will ask you to connect your iPhone, iPad, or iPod. After connecting the device to your PC, you will be able to start the backup as shown in the above screenshot. The below screenshot shows the software interface without any connected device. After connecting your device, simply click the “Back Up Now” button at the bottom of the application. 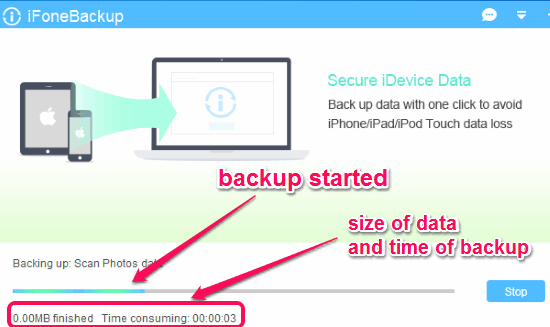 The backup will start instantly and you can see the amount (or size) of data backed up (in MBs) and the time taken to backup your data. If you wish to cancel the backup process in between, then simply click the “Stop” button at the right side of the application. The following screenshot shows the size of data and time taken while backup. Apart from providing the easiest and simplest way to backup iPhone’s data, it also allows you to encrypt your backup file with a password. Simply click on the drop-down menu and go to settings to encrypt the backup file or change backup directory. 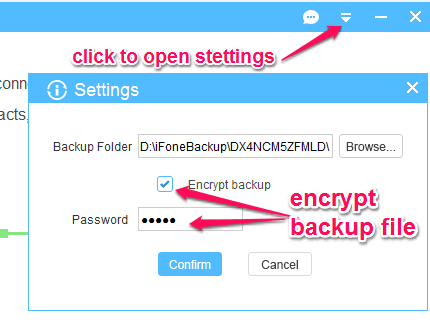 The following image shows how to encrypt the backup file. From the drop-down menu, you can also view backup history, open backup folder, settings, etc. We have also reviewed Freeware to Backup, Restore iPhone without iTunes: Shelbee and iPhone Backup Extractor: Recover iPhone data from iTunes backup. iFoneBackup is a very useful freeware for Windows, which lets you backup your iPhone’s data with ease. Just one click and you can achieve backup of data, like photos, contacts, apps, notes, etc. You can encrypt the backup file directly from the app. Honestly, I like this software because it also backs up my call log, with other data. Try this software from the link here.